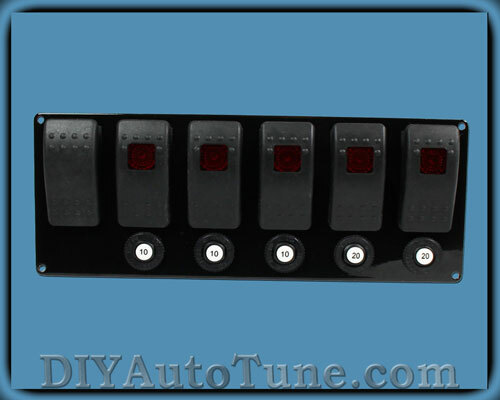 6 circuit switch panels - Miata Turbo Forum - Boost cars, acquire cats. We'd seen similar switch panels in other racing catalogs, and were convinced we could deliver the same quality for less. This one has a momentary starter switch and five on-off switches with resettable circuit breakers, because if you need to limp your track car back to the pits, letting it cool off and pushing a button beats finding a fuse. They're priced at $109, compared to $139 you'd pay for the same switchgear elsewhere. Lots of stuff from my NA BRG partout.